English for International Journalists is a clear and engaging step-by-step guide for non-native speakers using English in journalism across all forms of media. In-depth language analysis is provided in the specialised context of journalism, as well as a comprehensive approach to the rules and guidelines necessary for avoiding the pitfalls and errors that undermine accuracy and clarity. • Reporting economy, health and the environment. The book is closely supported by online resources concentrating on the spoken word, intonation and pronunciation, and also features an expansive range of exercises and tests, suitable for self-study or to be set as coursework. English for International Journalists presents readers with the essential tools for producing journalism in English today. 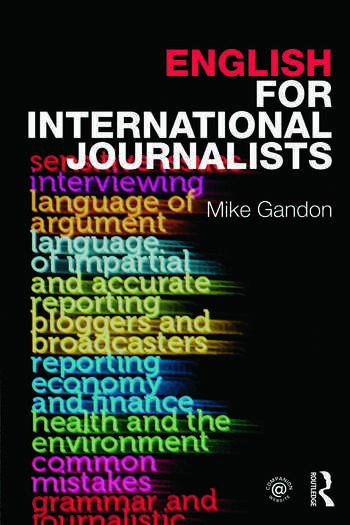 Mike Gandon is a module leader on the postgraduate Masters in International Journalism at City University. He has 15 years’ experience of teaching journalism to students who do not have English as a first language. He has also taught overseas. He is a former programme editor with the BBC. Heather Purdey was Director of the MA International Journalism programme and a Senior Lecturer in the Graduate School of Journalism at City University, London. She is now a Visiting Fellow. She has 15 years’ experience of teaching journalism to students who do not have English as a first language and has worked in print and radio journalism and, briefly in television. She is the co-editor of International News Reporting: Frontlines and Deadlines (2009).